Tricia Lewis, our Fashion Herald blogger, is out on maternity leave. Following is a post from her co-worker Leah who is graciously filling in as guest blogger. With the holiday season fast approaching and visions of cocktails and gingerbread men filling my head, there’s really only one thing I’m thinking… Party Dresses! Naturally, I headed to Macy’s in search of some glitz and glam to kick start my favorite season. 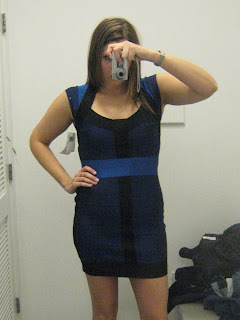 First up, a blue bandage dress by French Connection ($168). Normally I avoid anything tight, but this dress feels like a comfortable girdle (how is that possible?) that would allow me to indulge in some hors d’oeuvres and not feel like I immediately needed to run home and put on sweats. 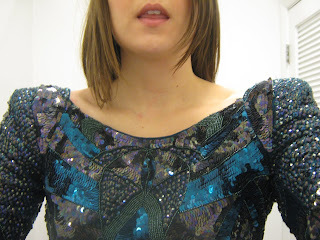 Mmm sequins galore (below). I love love love the 80s vibe and neckline. A note on logistics though: While motor skills have never been my strong point, I found this dress especially hard to zip up. I would suggest bringing reinforcements when you try this one on. French Connection $398. 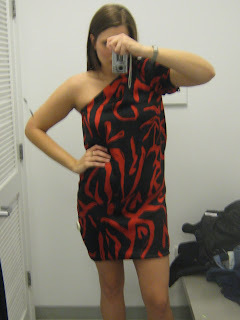 This red and black Rachel Roy dress for $109 was a little boxy, and could have used a belt. 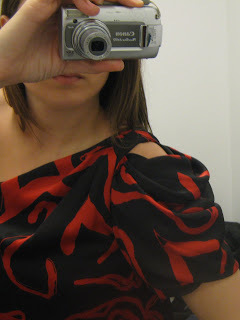 I definitely enjoyed the shoulder detail however. This multicolored dress with velvet details by BCBGeneration for $118 was both comfortable and practical (hello pockets) while also being fun enough to make an appearance after 6pm. Last, a slightly whimsical piece by Walter ($298) was full of great detailing and made me feel like I could be one of the skating winter fairies from Disney’s Fantasia. Maybe I’ll have to give it a test run at The Pond at Bryant Park, opening Nov 6. Macy's Herald Square, 151 W. 34th St. btwn Broadway & 7th Ave.
Leah, you have to get that French Connection dress! 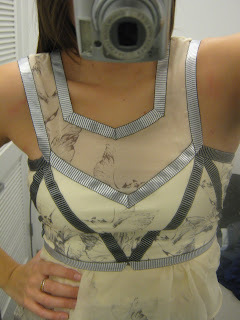 I love the shoulders on you! And that Walter dress is pretty freaking fabulous on you also! 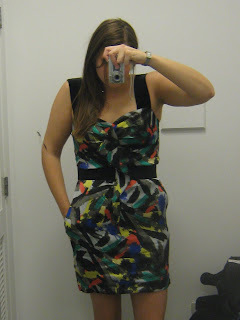 Love the colors of the Rachel Roy on you...it could definitely be altered or belted! Love that last one especially. These all put me in mind for New Years and all the holiday festivities coming up. That Walter dress is really quite beautiful! Me like very much! Also: I'm very excited about ice skating season. Though less enthusiastic about the accompanying cool weather! Ooh i LOVE that sequin dress it is amazing! !